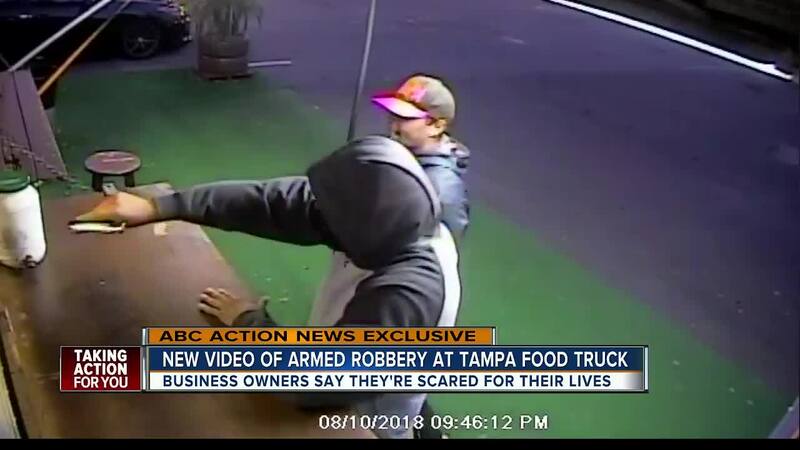 TAMPA, Fla. — Two men robbed a customer and pointed a gun at two employees at Los Gorditos food truck on Hillsborough Avenue Friday night. The food truck has cooked up traditional Puerto Rican cuisine in the community for 15 years. Employees say they’ve never been the victims of such a terrifying crime. Rivera was working with his co-worker Melahro Sanchez when the two men seen on surveillance video walked towards the truck. It was a Friday night just after 8 p.m. when Rivera said one of their regular customers was waiting for her food. At first, the victim seen on surveillance video appears startled as two men walk towards the truck, seconds later a man with a baseball cap on snatches her phone out of her hand then grabs the money on the counter. 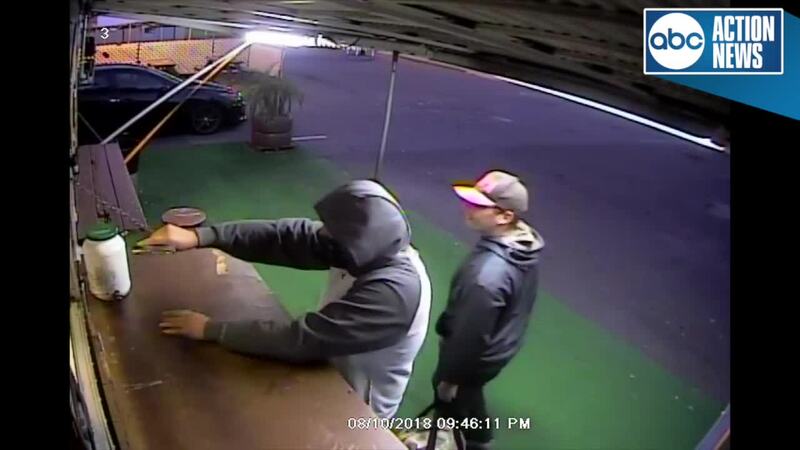 A man with his face partially masked holding a gun tries to break into the food truck. The door is locked, so he goes to the front pointing the silver handgun towards the order window. "I was thinking the worst that they were going to kill me,” Sanchez said. Sanchez tells us once it gets past 7 p.m. she begins to worry. Local businesses are closing, and they are all alone waiting for customers to get off work and order dinner. The victim in the video has her phone stolen and a gym bag. She was too scared to talk on camera about the robbery. The two men were last seen running north on Hillsborough Avenue. Crime Stoppers of Tampa Bay is offering a reward of up to $3,000 for information that leads to the identification and arrest of the unknown suspects involved in this case. Anyone with any information regarding the identity of the suspects and who wants to be eligible for a cash reward is asked to call Crime Stoppers at 1-800-873-TIPS (8477), report anonymously online at www.crimestopperstb.com, or send a mobile tip using the P3 Tips Mobile application. Crime Stoppers must be contacted first in order to be eligible for a cash reward.